Wanted to make your delicious lonnganisa more special? Try this recipe! 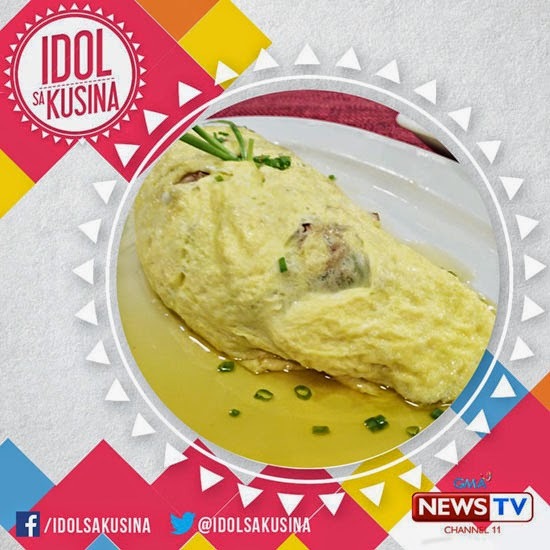 Longganisa Omelette is another masterpiece of celebrity chef and “Idol sa Kusina” host, Chef Pabloy “Boy” Logro. The ingredients and the procedure are pretty basic so I see no problem if you will try this at home. Give your longganisa a new look and taste! Try the longganisa omelette recipe today! 1). In a bowl, combine whisked eggs, cream, salt and pepper and sliced spring onions. Set aside. 2). In a pan, saute and brown the longganisa in little oil. 3). Add in the onions, bell peppers, finger chilies and butter. 4). Add in the mushrooms and a splash of vinegar. 5). Cook for a minute or two then set aside. 6). In the same pan, cook the egg until cooked through. 7). Place the egg on a plate, top it with the sautéd longganisa and vegetables and fold the egg. 8). Garnish with spring onions and serve. Does the first step make the eggs fluffier? I would like creamy omelettes! It's my first time to visit this blog. I'll try this recipe and see if my kids like it. It looks delicious and healthier too. Ohhh this is yummy! I would definitely give this a try!